From the beginning, Dungeons & Dragons has included a few spells for dungeon masters. In my last post, I cited Magic Jar as inspiration for adventure. Player characters won’t cast it, but villains might. In today’s game, Glyph of Warding caters to DMs. PCs rarely have lairs and virtually never find them raided by murderous treasure hunters. Glyph of Warding protects lairs and treasure, so PCs don’t cast it anymore. They used to cast it. In the game’s early days, PCs might rest in the dungeon and use a glyph to defend against wandering monsters. PCs might build strongholds to defend. DMs might even send thieves after the players’ treasure. Back then, many DMs thought angry players were just sore losers. Also, older rules allowed players to misuse the glyphs. For instance, they would put evil-sensing, exploding glyphs on things like arrows, and then pose as either Green Arrow or Hawkeye, depending on favorite color. Fifth edition ends such hijinks by ruling that moving a glyph more than 10 feet breaks it. Now the Glyph of Warding serves you, as a DM, and the villains you control. Traditionally, glyphs appear as traps in empty crypts and on treasure hoards, but glyphs work best as defenses in combat encounters. A cunning wizard or cleric would plant glyphs in the throne rooms, arcane laboratories, and chapels where intruders might attack. As a tool for Evil, 5E’s Glyph of Warding opens plenty of room for abuse. I could let an evil wizard advise you on how to use glyphs, but he would lead you too far. Angry players are not sore losers. Even though your villain has the means to create glyphs that would frustrate and destroy the PCs, you need to devise wards that simply challenge the party. Good games come from fun, challenging, and winnable encounters. For a glyph to help defend the dark lord’s lair, it must spare servants and henchman. The spell offers several options: If the lord only employs drow or undead, a glyph could spare those sorts of creatures. A master with only a few allies might award them talismans that let them pass some glyphs. Servants could be trained to avoid others. Long before D&D grew to embrace mystery and intrigue, Gary Gygax created the Detect Evil spell. Since then, Know Alignment made getting away with murder impossible. Following Pathfinder’s lead, 5E purges all the spells and abilities that reveal alignment—except for Glyph of Warding. I suspect the designers overlooked this loophole. Unless you want a world where trials begin—and messily end—with the accused forced to walk over a glyph that blows up evil creatures, ignore the alignment trigger. Glyphs are nearly invisible and require a successful Intelligence (Investigation) check against the caster’s spell save DC to spot. 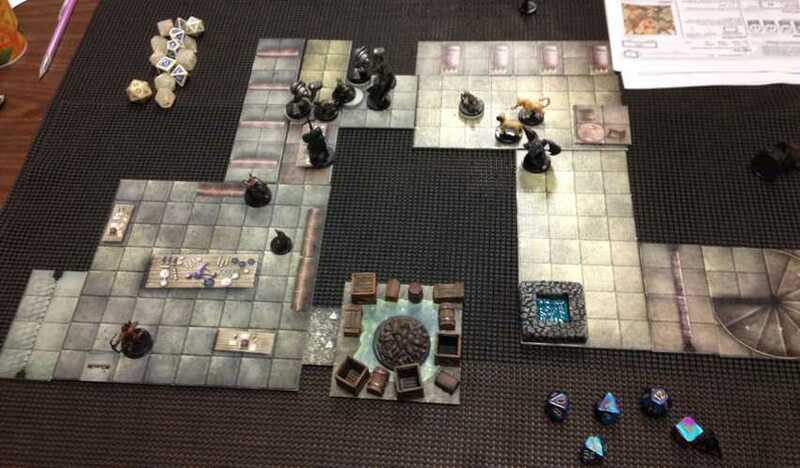 In a combat encounter, let characters take an action to attempt to find all glyphs within, say, 5 feet. Through third edition, Glyph of Warding specified that casters could only store a “harmful” spell. This prevented casters from scribing helpful glyphs on the pages of a book, creating a collection of self-casting scrolls. Still, the word “harmful” left plenty of room for interpretation. For example, spells that unleashed negative energy could heal undead. The fifth-editon spell drops the word “harmful.” I suspect that the designers felt the word lacked rigor, and that making glyphs immobile made non-harmful glyphs impractical to adventurers. After all, stationary glyphs can’t become self-casting scrolls. But for an evildoer defending a lair, helpful glyphs create a sort of lair action. Casters could store healing spells on the floor of their cult headquarters, each to be triggered with a step. They could lay a path over Stoneskin and Greater Invisibility glyphs. In 5E, a spell triggered by a glyph lasts its full duration, without any need for concentration. A caster could trigger a series of buffs as part of a move action, and bypass all their concentration requirements. As an encounter designer, a helpful glyph sprung out of view just adds a power to a villain’s stat block. You admire the villain’s (your) ingenuity, but the players never see it. To be interesting, an enemy needs to trigger a helpful glyph in plain sight, perhaps after negotiation turns to combat. Imagine a foe who triggers healing glyphs just as the players think they have won the upper hand. When players realize they must immobilize their foe to win, the battle turns into an interesting, tactical puzzle. Update: Mike “Sly Flourish” Shea noted that the fifth-edition description says the spell lets the caster “inscribe a glyph that harms other creatures,” so unless you rule that this description qualifies as flavor, then any helpful glyphs your villains use must be a unique variation on the usual glyph. Villains can also defend their lairs in a traditional way, with harmful glyphs that wreck intruders. Harmful glyphs can either trigger explosive runes or a spell that targets a single creature or an area. Explosive runes deal about as much as any third-level spell, so they work well. However, if you put an encounter on a minefield, no one has fun. Everyone marks off the damage and vows not to move. Many of the spells you can pair with glyphs lead to livelier battles. Area-effect spells with lasting effects encourage movement. Single-target spells that blind or curse PCs will lift routine slug-outs by forcing new plans and by putting different characters in the spotlight. Explosive runes may not appeal to evil masterminds either. Cleaning up blast damage in an arcane laboratory can be such a bother. A glyph that turns an intruder into a toad lets you gloat, and then squish. Delightful! Even lower-level spells can guard an attack route with less mess. For instance, the door and threshold to the dark chapel could trigger Darkness and Silence unless those who enter speak a short prayer. If an acolyte forgets, the glyph does no lasting damage. If intruders enter, they cannot target attacks or cast spells. The following lists include the most dangerous or interesting spells to pair with a glyph. Darkness [2nd-level Illusion] (V, M) (casting time: 1 action) (duration: Concentration, up to 10 minutes) 15-foot-radius sphere. p.230. Silence [2nd-level Illusion] (V, S, M) (casting time: 1 action) (duration: Concentration, up to 10 minutes) 20-foot-radius sphere. p.275. Flame Strike [5th-level Evocation] (V, S, M) (casting time: 1 action) (duration: instantaneous) Dexterity save. 10-foot-radius cylinder. p.242. Blade Barrier [6th-level Evocation] (V, S) (casting time: 1 action) (duration: Concentration, up to 10 minutes) Dexterity save. p.218. Fire Storm [7th-level Evocation] (V, S) (casting time: 1 action) (duration: instantaneous) Dexterity save. 10 10-foot cubes. p.242. Faerie Fire [1st-level Evocation] (V) (casting time: 1 action) (Concentration duration: 1 minute) Dexterity save. 10-foot cube. p.239. Cloud of Daggers [2nd-level Conjuration] (V, S, M) (casting time: 1 action) (duration: Concentration, up to 1 minute) No save. Five-foot cube. p.222. Web [2nd-level Conjuration] (V, S, M) (casting time: 1 action) (duration: Concentration, up to 1 hour) 20-foot cube. Dexterity save. p.287. Stinking Cloud [3rd-level Conjuration] (V, S, M) (casting time: 1 action) (duration: Concentration, up to 1 minute) 20-foot-radius sphere. p.278. Confusion [4th-level Enchantment] (V, S, M) (casting time: 1 action) (duration: Concentration, up to 1 minute) Wisdom save. 10-foot-radius sphere. p.224. Wall of Fire [4th-level Evocation] (V, S, M) (casting time: 1 action) (duration: Concentration, up to 1 minute) p.285. Cloudkill [5th-level Conjuration] (V, S, M) (casting time: 1 action) (duration: Concentration, up to 10 minutes) Constitution save. 20-foot-radius sphere. p.222. Wall of Force [5th-level Evocation] (V, S, M) (casting time: 1 action) (duration: Concentration, up to 10 minutes) p.285. Wall of Stone [5th-level Evocation] (V, S, M) (casting time: 1 action) (duration: Concentration, up to 10 minutes) p.287. Does a Wall of Stone summoned by a glyph create a permanent wall? The demolition makes this impractical for lair defense. Wall of Ice [6th-level Evocation] (V, S, M) (casting time: 1 action) (duration: Concentration, up to 10 minutes) p.285. Reverse Gravity [7th-level transmutation] (V, S, M) (casting time: 1 action) (duration: Concentration, up to 1 minute) Dexterity save. 50-foot-radius cylinder. p.272. Sunburst [8th-level Evocation] (V, S, M) (casting time: 1 action) (duration: instantaneous) Constitution save. 60-foot-radius. p.279. The spell description fails to specify a cylinder or sphere. Blindness [2nd-level Necromancy] (V) (casting time: 1 action) (duration: 1 minute) Constitution save. p.219. Hold Person [2nd-level Necromancy] (V) (casting time: 1 action) (duration: Concentration, up to 1 minute) Wisdom save. p.251. Unlike with Blindness, targets get a new save on each of their turns. Bestow Curse [3rd-level Necromancy] (V, S) (casting time: 1 action) (duration: Concentration, up to 1 minute) Wisdom save. p.218. The best single-target spell to pair with a 3rd-level glyph. Harm [6th-level Necromancy] (V, S) (casting time: 1 action) (duration: instantaneous) Constitution save. p.249. Levitate [2nd-level Transmutation] (V, S, M) (casting time: 1 action) (duration: Concentration, up to 10 minutes) Constitution save. p.255. Targets that lack ranged attacks could be removed from battle for 10 minutes. Rules question: Will a victim rise 20 feet and stop, or keep rising? Blight [4th-level Necromancy] (V, S) (casting time: 1 action) (duration: instantaneous) Constitution save. p.219. Phantasmal Killer [4th-level Illusion] (V, S) (casting time: 1 action) (duration: Concentration, up to 1 minute) Wisdom save. p.265. Polymorph [4th-level Transmutation] (V, S, M) (casting time: 1 action) (duration: Concentration, up to 1 hour) Wisdom save. p.266. Turn the target into a frog or a rat for an hour. Probably the best single-target spell to pair with a glyph. Flesh to Stone [6th-level Transmutation] (V, S, M) (casting time: 1 action) (duration: Concentration, up to 1 minute) Constitution save. p.243. Otto’s Irresistable Dance [6th-level Enchantment] (V) (casting time: 1 action) (duration: Concentration, up to 1 minute) Wisdom save, but irresistable until the target takes an action to attempt to resist. p.264. Feeblemind [8th-level Enchantment] (V, S, M) (casting time: 1 action) (duration: instantaneous) Intelligence save. p.238. This entry was posted in Advice, D&D fifth edition and tagged alignment, encounters, Gary Gygax, spells. Bookmark the permalink. David, this article is full of great ideas. I’d dismissed Glyph as a sort of magical anti-personnel mine, completely missing the non-harmful uses you highlighted. Combined with earlier reminders to use terrain advantages, apprentices and brutes, and forewarning (with alarm and scrying spells, information networks, familiars, etc. ), “murderous thieves” should think twice, then go home, instead of taking on a well-prepared spellcaster. From a crunch perspective, I really appreciated the in-depth consideration of spells to store in Glyphs. Now I can’t help but see Glyph as a lower-level Contingency spell, allowing chained conditionals to produce cool lair actions, layered effects, and shameless exploitation of that broken concentration limit – thanks! The paragraph beginning “As a tool for Evil…” contains great advice that strikes at the heart of the DM’s role: have fun and make sure the players do too. Using Glyphs creatively should increase player immersion in the struggle and their respect for the danger the BBEG represents. Glyphs need to follow the same rules that you called out in the pieces on gotcha/interactive traps and skill checks – use them to challenge and engage, but not frustrate the players. Thanks for reminding us that even “evil” casters should use their powers for good, even if it’s only for the good of the players… most certainly not their opportunistic, lair-robbing, murderous characters! David, I loved this article. I have a question. I was wondering if the ward could have a teleport spell attached to it? And if so would it send the pc to a place of the evil wizard choosing? I am just looking into different story arcs. Making a pc dissappear to a different area and having to find there way back. Glad you liked the post. Thanks! I figured no one but me would be interested, so I’m pleasantly surprised that folks liked it. The teleport spell targets “you and up to 8 willing creatures” so it doesn’t work with the written version of the glyph. Nonetheless, the trick of teleporting unwilling PCs dates to the beginning of the game. Gary even suggested it in the 1974 brown books. So if you have enough fun in store to merit the yanking PCs to parts unknown, you have Gary’s blessing. I don’t recommend splitting a lone PC from the party though. 1. Why is there no wizard glyph spell? 2. How about monster summoning? Thanks for commenting. Glyph of Warding is on the Wizard spell list. Summoning spells do not target a single creature or an area, so they cannot be triggered by a glyph. Amazing article! My mind is running with ways to use it to announce messages and illusions, a la the Wizard of Oz, without having a man behind the curtain. Sort of like the scene in Disney’s Brave with the cauldron and potions to navigate the message system. I’m wondering if ‘Suggestion’ wouldn’t work. I assume the sentence or two mentioned in the spell description are a part of casting the spell, so that’s not a problem. Hi David, I am preparing for a one shot and I was wondering if the following combination of spells is a viable possibility. The first is a Contingency spell cast with Dimension Door, if the villain is killed the contingency will come into effect, given that the place where they want to teleport (onto a table in their lair) is within 500ft their dead corpse would teleport there. There is a Glyph of Warding on the table that triggers a revivify. I guess my question is does a Glyph of Warding dispel once the caster is dead and can it be triggered by a corpse? It doesn’t say it dispels on death, so it is your choice I’d say. Very inventive choice!